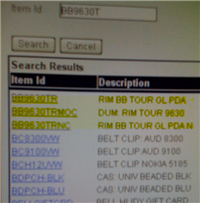 We’ve been hearing that the Verizon BlackBerry Tour would be coming out this summer for some time now, however, it would appear that the device has made it’s way into Verizon’s database. That means the BlackBerry Tour has to becoming out very soon doesn’t it? Not necessarily, but, one can hope. I am all but sure that I will be getting a Tour as soon as it comes out, unless, however, an updated OS of the BlackBerry Storm so spectacular comes out that it makes the Storm function as well as everyone thought it would when it was first announced.